Two wildfires in the Ashdown Forest were started accidentally by volunteers, it has emerged. The separate blazes began on Tuesday as a result of planned burning that grew out of control. Ashdown Forest was famously the basis for the Hundred Acre Wood in the Winnie the Pooh novels. The Conservators of Ashdown Forest said "a freak gust of wind combined with unseasonably dry conditions" was to blame and nobody was hurt. The first fire, in Nutley, was reported at 12:30 GMT on Tuesday and destroyed 31 hectares. The second, an hour later in Kidds Hill, Hartfield, destroyed two hectares. At least 65 firefighters were at both sites, and had quelled the blazes by dusk. The Hatfield fire was the result of sparks from a bonfire going awry, as volunteers carried out scrub control work. 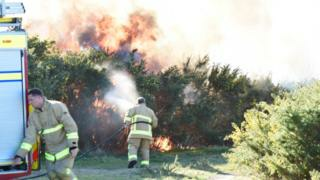 The Nutley fire was started for a planned burn of gorse management. A spokeswoman for the conservationists said: "Gorse is an increasing problem on the forest and small controlled burning has traditionally been a routine method of managing it. "Burns are carried out in February to avoid impacts on nesting birds." She added: "The good news is that neither fire will cause any long-term damage to the habitat or landscape and only a small proportion of the forest, a little over 1% of its 2,500 hectares, has been affected." East Sussex Fire & Rescue was informed of the planned burns, and others were carried out successfully earlier in February. Temperatures of 17C (62.2F) were recorded on the day - with the average maximum temperature for February just 9C (48.2F).